As officials at North Carolina beaches contend with a string of shark attacks off the state’s coast, those in New Jersey have been dealing with an oceanic problem all their own: potentially deadly Portuguese man ‘o wars steadily washing ashore. The strange yet striking animal may look like some kind of jellyfish, but the man o’ war is in a different class altogether. Its poisonous tentacles can easily grow to between 10 and 30 feet, and can sometimes reach an astonishing length of 160 feet. 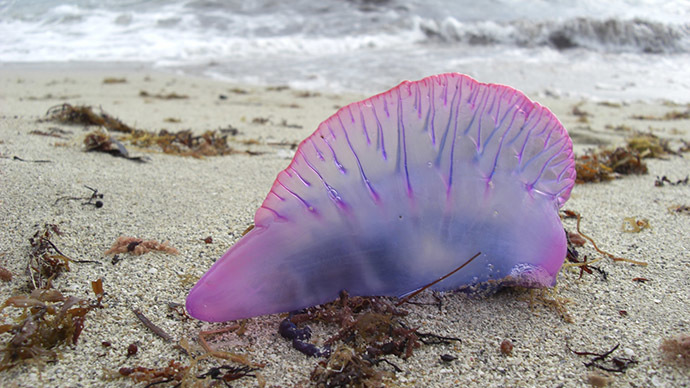 The creature is often seen sporting blue and purple colors and has a translucent body that looks like it’s filled with air. Although the man o’ war typically populates warm waters in tropical oceans, coasting along the surface of the water and catching small prey with its tendrils, ocean currents and strong winds can sometimes lead it into less expected places, such as the Jersey Shore. The animal has already been spotted at least two dozen times in the stretch between Long Beach Island and Stone Harbor, local WPVI reported. That’s a stretch of close to 70 miles. Just how venomous a man o’ war sting can be depends, in part, on the victim’s age, size and overall health, as well as the sting’s location. If a person is stung in deep waters and cannot quickly get to shallow water, they may be at risk of drowning. “Their stings are among the most painful and if somebody is allergic to bee stings or something like that, you can go into shock,” Dr. Paul Bologna, associate professor of biology at Montclair State University, said to NBC 10. Grown men may not face as much risk from a man o’ war as women or children because their skin tends to be thicker, Angel Yanagihara of the University of Hawaii told National Geographic. “If a child gets stung around the neck, it could potentially be a lethal event because so much of the venom can be injected into the bloodstream,” she said. Although we tend to think of man o’ wars as single organisms, they are actually composed of numerous individual parts that are genetically identical, but perform different functions. If separated, however, they cannot survive on their own.